Rain, work, Tour de France. Rain, work, Tour de France. That's what's been occupying our time for days. The Tour de France is something we watch just at the end of each afternoon. This year, it has been very interesting because it wasn't absolutely clear who would win until yesterday. I've never been interested in sports much, but I am getting hooked on the Tour de France. The anxiety and suspense during yesterday's time trials was too much -- I had to leave the room for a bit. I never usually care that much about any sporting event. This one is different. And, we get to see so much of France during this hour or so at the end of each day when we're in front of the TV, watching the Tour. 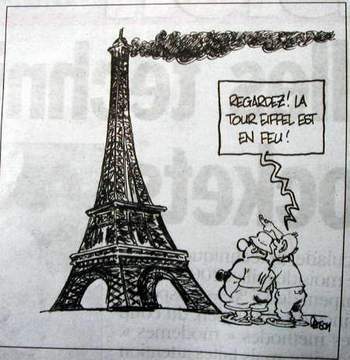 At left, a cartoon about the fire (see the previous page) in the Eiffel Tower, from Le Parisien, July 24, 2003, p. 3. 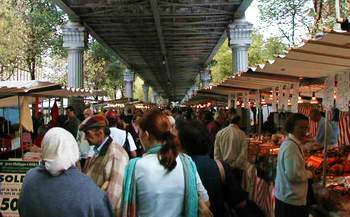 Market under the elevated tracks at blvd. de Grenelle All day, every day, we've been working on the new textbook, The Norton Album, and doing the necessary reading and searching for material to include in it. With that and the rain, I haven't been able to take many pictures. You can see that on the 24th, I was really compromising -- there just isn't much to show. The digital camera doesn't like rain. 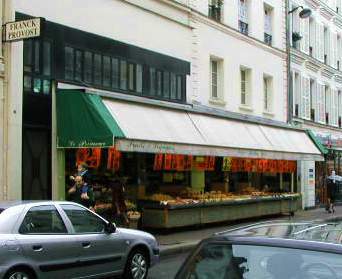 But this morning I went out with it in hand -- off to the market at Grenelle to buy Le Parisien Dimanche, an absolute necessity because of all the Tour de France info that it contains. And so I took some shots of places we frequent in the 'hood. I could not resist taking a stroll through the market (at left). Randonée riders -- just a few of the 10,000 who rode the Champs Élysées at 8:30 this morning. 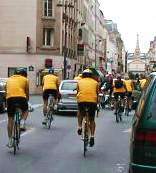 Early this morning, there was a randonée of cycling enthusiasts -- 10,000 of them -- on the Champs Élysées. I saw several of them on their way home after. They were mostly guys in their 50s and 60s, I'd say, and they were in great shape. I had trouble capturing them on the camera because of light rain. 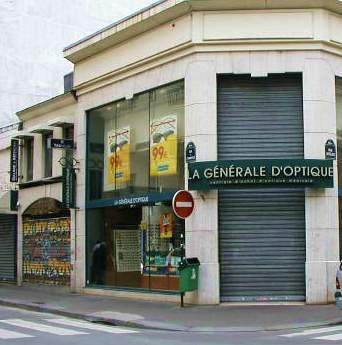 But here are a few, on the rue du Commerce. 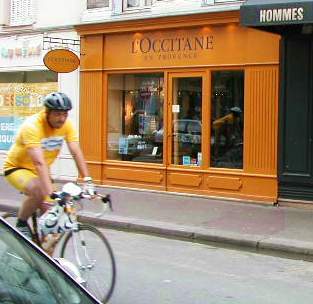 Rue du commerce is getting to be very trendy, with chain boutiques like L'Occitane. Of course, we have managed to go out in the evening for dinner. But it has been a bit sad because most of our favorite restos are closing for vacation for three or four weeks, starting this weekend. Thursday, we went to Oh! Duo with a new friend, Alan, and we had a lovely time. But first, and importantly, we met Nico, Alan's kitten. Alan and Nico are very interesting and nice. I can't remember what Tom and Alan had, but I had a shrimp salad and rabbit -- both excellent. And Alan and I shared a nice bottle of white Sancerre. Mr. and Mrs. Valero closed yesterday and won't be opening again until the day we leave. Sob. Then Friday we went to Le Bayadère, down near the end of our street, close to the Seine. They have a terrine made with Corsican cheese (very rich stuff! ), but unfortunately it was "non plus" (none left) and I'll have to remember to try it another time. Instead, I had a duck terrine with pistachios -- delicious! -- and dorade, one of my favorite fishes. The dorade came with a compote of those marinated, cooked vegetables, Provençale style. I'm becoming so fond of those that I'll have to figure out how to make them. 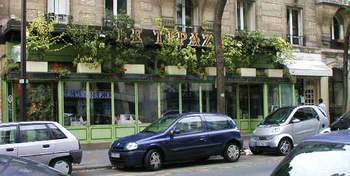 Le Tipaza, a North African resto near us that is open every day, all year. It is right outside the Emile Zola metro station. Tom had a green bean salad for a first course, and for his main dish he ordered the special of the day, a gigot d'agneau (slices of leg of lamb). The specials are just told to us verbally, and we didn't know what the accompaniment would be. We should have asked, because it came with a huge serving of green beans! Oh well. My dinner was better than his, but we're still keeping this place on the list. It is quite good. I hope they don't close for vacation. Then last night, we went to Stephane Martin. What a nice experience that was. We're recognized, and we always are greeted warmly there. Madame, the patrone, was there. She is a very handsome, dark woman from the Antilles. She came over to our table a couple times. 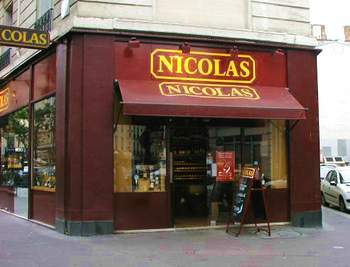 The wine store that I frequent at Emile Zola and Commerce. Nice people in there. Tom had a souris d'agneau (whole upper part of the leg of lamb, roasted) which was juicy and so tender it fell off the bone -- much like the jarret de porc (pork roast for two) that we like to order at this same resto. I had Suprême de Canette (the best part of the duck) which was also very good. It came with a terrific sautée of mushrooms, shallots, and other nice things. Tom could not resist. He had the moelleaux au chocolat, a disastrously rich and heavenly dessert for chocolate lovers. He generously allowed me to share it with him. Madame sent two glasses of an after dinner drink to our table - a gift. We thought it was something like an apricot brandy, but it was actually a special rum from the Antilles. It has an unpronounceable name, something like "schlorwbl." It is made with cinnamon, oranges, prunes, and something else. Madame came over and told us all about it. How nice that was! Wedding announcements can have an other-worldly aura here, like this one: La Comtesse Vincent de Boisséson en union avec le Comte Vincent de Boisséson est heureuse de faire part du mariage de son fils, Martin, avec Vaya Seriopoulou. The wedding will take place in Théssalonique (Grèce). Now there's one big, fat Greek wedding, I bet. 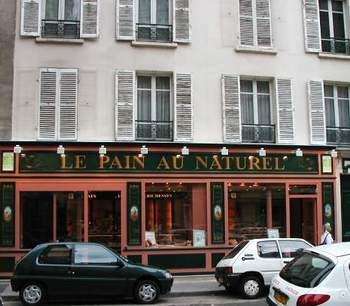 On a sadder note, 20 percent of the chestnut trees in Paris are sick. They're being attacked by a butterfly or moth larva, an invasive exotic parasite from Macedonia. The Service de l'Arbre is working on the problem. The larvae chew on the leave, the leaves turn brown, and the trees put out new leaves, which considerably weakens them. More about the war on tobacco: the French parliament voted on the 24th to forbid the sales of tobacco to those less than 16 years old. Those who violate the new law are subject to a 150 euro fine, or more. Parliament also decided to raise the cigarette tax by three more points. And, the sale of packs of fewer than 19 cigarettes has been forbidden. On immigration: On the 25th, the national police announced that they'd processed 16,893 cases of "foreigners in irregular situation," informally known as the "sans-papiers" (people without papers) in the first half of 2003. This is an increase of 9.4% over the same period last year. Most of the cases involve Algerians, Moroccans, Chinese, Romanians, Iraqis, Senegalese, Ivorians, Turks, Tunisians, Camerounese, and Pakistanis. Above, a new bakery on rue Foundary, open Sunday, and the primeur (fruit and vegetable shop) near us, also open Sunday morning. The outcome isn't generally favorable for the sans-papiers, I guess, because the government issued a statement saying that the higher number of cases processed corresponds to the will of the government to apply the law -- "the period of laxity is ended," said Minister of the Interior, Nicholas Sarkozy. Indeed, we notice fewer poor, dark homeless men sleeping in the parks this year. Victor defends the environment. One of my favorite little newspapers is Metro. It is free, Monday through Friday. I pick it up in front of the bar/tabac closest to us. Unfortunately it, too, is going on vacation until August 25. In its last issue before the hiatus, it announced a competition/campaign that my Ecosanibel friends will like. 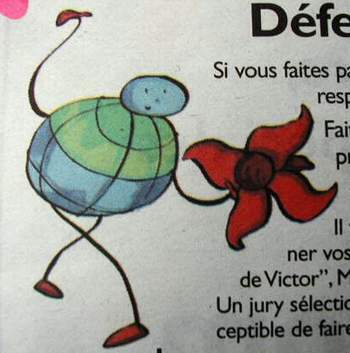 Called "Les Coups de chapeau de Victor" (tipping of Victor's hat), the competition seeks descriptions of pro-environment initiatives undertaken between July 2003 and June 2004. Each month, a jury will select the best initiative for fighting for the preservation of the environment, and will feature it in Metro. See more at Parisecologie.com.